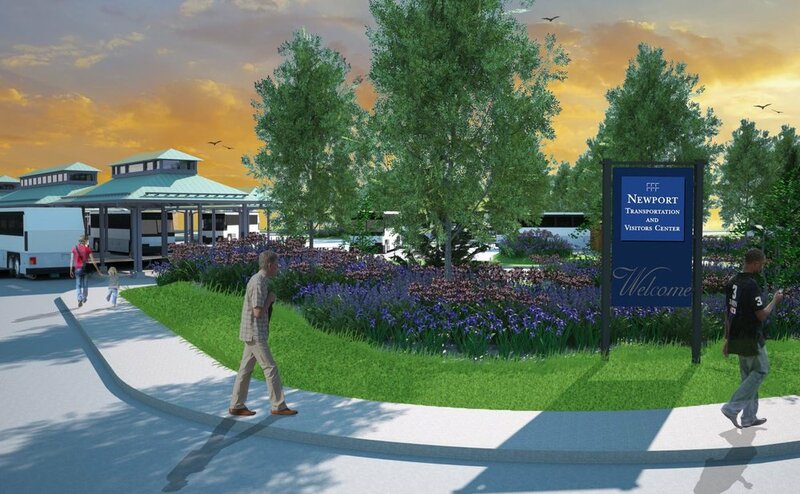 In October 2012, Hurricane Sandy ravaged the Newport coast, causing massive wind and flood damage to the Newport Transportation & Visitors Center, a major transit hub for the Rhode Island Public Transportation Authority (RIPTA) and a critical regional visitor's center for the City of Newport . In its wake, RIPTA was able to obtain over $6 million of Federal Emergency Relief Funds through the Federal Transit Administration (along with a 10% match from the City of Newport) aimed at repairing the exterior damage, while also developing a permanent site design solution that will enable the facility to be far more resilient to future storm surge, high winds, and periodic salt water inundation. In June 2016, RIPTA engaged a design team led by Northeast Collaborative Architects to develop solutions to the general project goals: Restore overhead canopy protection; Reduce surface runoff from the site in order to both minimize the impact on Newport’s stormwater system and mitigate flooding in future storms; Bring the facility up to industry standards for an intermodal hub, including improvements to lighting, signage and other features that will allow the public to more easily make their transit connections; And respect the facility’s importance to the State’s tourism industry and its local impact by giving special attention to design and aesthetics. As part of the design team, WDA Design Group was tasked with developing vehicular, pedestrian, and bicyclist circulation and safety solutions, ADA compliance, design and selection of hardscape surfaces and site furnishings, planting design, and coordination with the project civil engineer to develop innovative stormwater management solutions such as rain gardens, bioretention basins and permeable pavers. Highlights of the design include elements that help to ensure a more resilient and sustainable site. This includes the use of high albedo concrete pavement throughout the project site to simultaneously increase vehicular pavement durability while also reducing heat island effect; incorporating native shrubs, ornamental grasses, meadows, and wetland seed mixes that permit reduced water consumption while also showing the ability to withstand periodic inundation from stormwater surge; introducing permeable unit pavers in pedestrian areas that reduce stormwater runoff to the enclosed site system; the development of bioretention areas to replace the existing enclosed system that connects to the City stormwater system, allowing stormwater to be recharged in-situ instead of being carried off site for discharge into the harbor; and introducing native trees species throughout the site that aid in reduced evapotranspiration and provide shade to reduce site temperatures and shelter for nesting areas. Pedestrian and bicyclist safety is addressed through the introduction of raised pedestrian crosswalks with smart-technology bollards. The bollards are equipped with motion detector sensors that trigger bollard and ground mounted lighting when activated, alerting oncoming buses of pedestrian activity ahead. Bicycle commuting is encouraged through the introduction of a shared bicycle lane on America's Cup Avenue that leads to a dedicated bicycle ramp for the site, adjacent to over a dozen new bicycle racks and a bicycle repair station donated by Bike Newport. Interpretive signage highlighting the sustainability and resiliency features incorporated into the site design are located throughout the site, donated by the Rhode Island Green Infrastructure Coalition.